Fighting Game Character Ultimate Dream-Match Art from UK! After we featured the crazy Grand Theft Mario cross-over fan art here, the madness continues with this “Dream Match / Roster” by Mike Williams from the UK about his favourite fighting game characters, ranging from the super popular Akuma, Morrigan and Ganondorf to nearly forgotten characters like Midknight from Eternal Champions or Cornell from Castlevania Judgement. 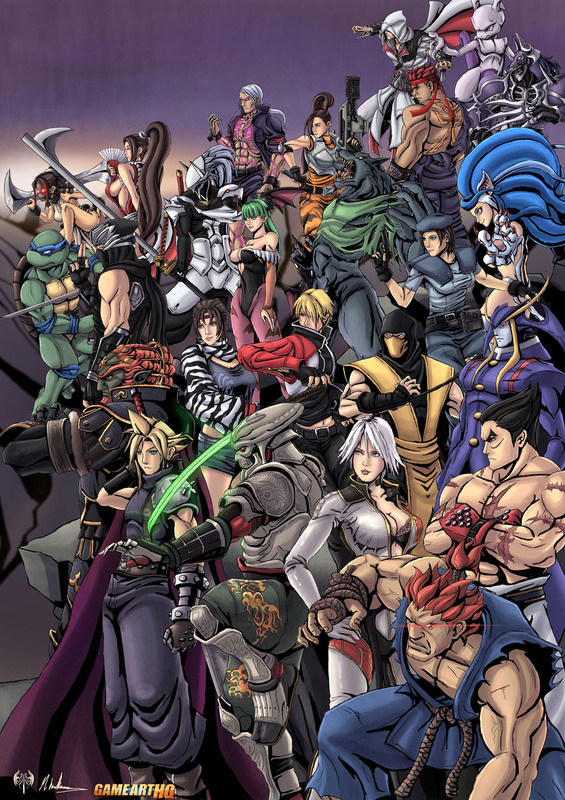 Hello Mike, what was the inspiration for this big fan art which combines so many different fighting and beat ’em up game series? Well, I was inspired to start this big project from various compilation artworks used in games, namely Final Fantasy Dissidia and Marvel vs. Capcom 3. I wanted to do something different that would have an impact instead of doing just single characters. Since you seem to play and know a lot fighting games of the last 20 years, what are game series which did not see sequels since years and should be continued in your opinion, and through what kind of sequels? I definitely think the Killer Instinct series should have carried on, without a doubt I think it’d be successful in today’s market. Stick one or two cameo characters in that would fit into the KI universe, to bring newcomers in that wouldn’t have known about the series. Thrill Kill, Power Stone and Guardian Heroes were also some of my favourites that would be refreshing to see sequels of too.